famed in antiquity (Theseus jilted Ariadne here, Dionysos in some versions found the wine) and beloved by Byron, this is the most majestic of the Cyclades, with the highest mountain (Zas, or Zeus, 1,000 metres, 3,295 feet), the most prosperous agricultural base and some outstanding architecture. The old town contains a rare and Striking mix of styles, with the well preserved walled Kastro of the Venetians (they regarded this as the capital of their Aegean possessions) lording it over the more haphazard and organic Greek town below. Not only are these two of the finest examples of medieval defensive planning and vernacular architecture respectively in Greece, they are also two of the best documented. The shape of the Greek town, With its characteristic maze of blind alleys, stubborn all the glance to and then sudden swerves: away from the contours, and seeming impossibility of returning “whence you Started, was dictated by the terrain, limited space, and the desire to baffle raiders and winds alike. But local laws dating from the Turkish period (the Venetians left in 1536) reveal that this seemingly chaotic harmony was also governed by principles constraining the size and right to light of the houses as well as the dimensions of the streets. No Other island blends the picturesque with the workaday quite so skilfully. 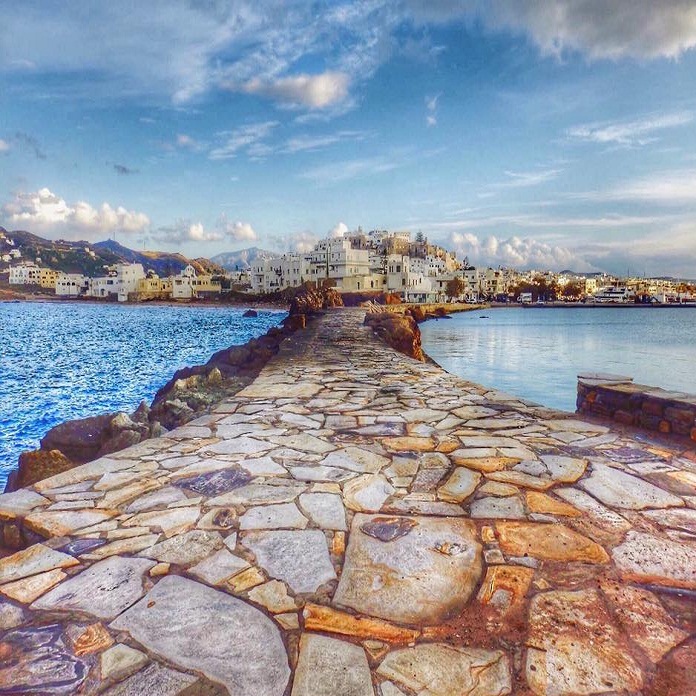 Arrive in Naxos by boat in the early afternoon, as the principal departures from Piraeus do, and you will be left in no doubt that this is still a proper working island. In other words, it will be closed during the heat of the day rather than staying open touting for touristic custom like some of its more mighty neighbours. Only the restaurants along its agreeable waterfront will show much sign of life. The island’s interior is one of wild mountain grandeur, prosperous little villages, magical meadows and olive groves all redolent with farm smells. It can be surprising to learn that Naxos grows the finest potatoes in Greece, less so to hear that it is also famed for fruit and corn. Apiranthos, its most beautiful village, also owes its present form to Venetians, having been rebuilt in the 14th century by the Sommaripa and Crispi dukes. Its modern inhabitants are among the many mountain Naxiots who trace their origins to Crete and are talented musicians. Coastal Naxos, alas, is well endowed with those most characteristic of modern Greek Structures: the unfinished and seemingly abandoned reinforced concrete block, bristling with exposed iron rods.